Galle, September 12: Team India on Tuesday registered a comprehensive victory over Sri Lanka after putting up a clinical all-round performance in the first ODI of the ICC Women’s Championship. Notably, Indian women team won the match by 9 wickets. Though opted to bat first, Sri Lankan batsmen could not stand up firmly against Indian bowling attack and were bundled out for a mere score of 98 runs in 35.1 overs. Medium pacer Mansi Joshi’s 3 wickets while Jhulan Goswami’s 2 wickets removed the top order of Sri Lankan team. While Poonam Yadav also picked up two wickets. The spin trio of Deepti Sharma, Rajeshwari Gayakwad and Dayalan Hemalatha chipped in with 1 wicket each. Skipper Chamari Atapattu top-scored for Sri Lanka women with a struggling 93-ball 33. Chasing the small target, the Indian openers Punam Raut and Smriti Mandhana looked at ease as they stitched 96 runs for the first wicket to seal the match for their side. But just when it seemed India women would reach the target unscathed with just three runs to win, Raut was dismissed. 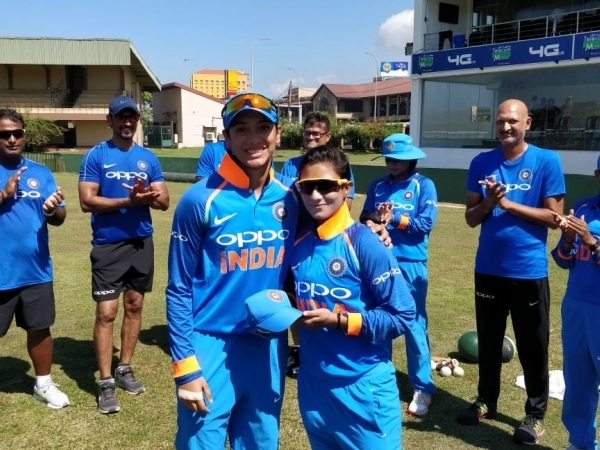 Mandhana starred with the bat for India women, scoring her runs off 76 balls and hit 11 boundaries and two sixes in the process. The second ODI of the series will be played here on Thursday. In the match, India's most iconic women cricketer Mithali Raj made another entry into record books as she has captained the Indian team for the most number of times in ODIs in women's cricket. Mithali Raj has now done the captaincy hat in 118 ODIs. The 35-year-old has also led team India to two world cup finals - 2005 and 2017 - in her career. While fast-bowler Jhulan Goswami also entered the record books for her splendid showing with the ball. The Indian bowler two wickets meant she now becomes the first woman to claim 300 wickets across all format. She is also a record-holder of 200+ ODI wickets to her name.